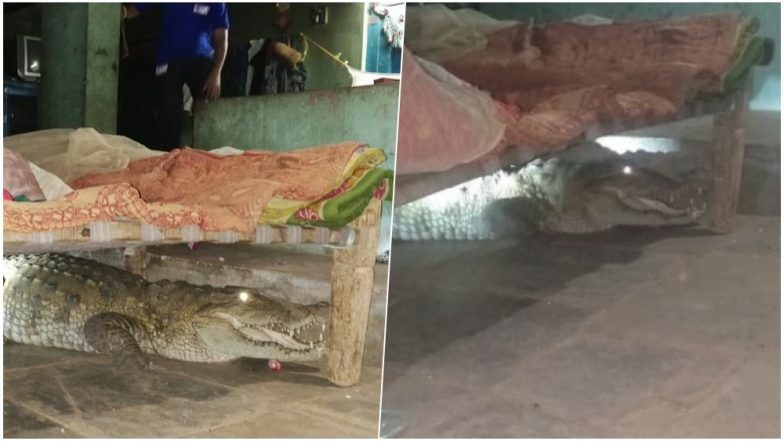 Gujarat Farmer Finds 8-Foot Long Crocodile Under His Bed, View Scary Pics! There have been multiple instances when farmers have found dangerous snakes in their yard or farmlands. But finding a huge crocodile within a house, that's sure scary. A farmer near Malataj village of Anand district in Gujarat was shocked to see the shiny eyes below his cot were of an 8-foot long crocodile! He was sleeping on a charpai when he was woken up by the barking dogs. When he saw, there was a huge crocodile under the cot. Chhattisgarh: Villagers Mourn Crocodile 'Gangaram's' Death, Decide to Set up Memorial For Their Beloved Protector. A farmed named Babubhai Parmar was doubtful when his dog started barking suddenly in the middle of the night. He saw two shiny eyes below his cot and he was of course scared. But his fears grew stronger when he found out it was a crocodile! He somehow managed to inform his family members about it and soon informed other villagers around. Hearing of a crocodile in the house, the villagers were also shocked. They quickly informed the forest officials. Pet Crocodile Mauls Woman Scientist to Death in Indonesia! Watch Shocking Video. The forest officials along with the help of volunteers from Daya Foundation arrived to rescue the crocodile. They put a net to catch the crocodile but it wasn't moving at all. On carefully observing the large reptile, they realised it was pregnant. Sarpanch Durgesh Patel was quoted in a TOI report, "It was an eight-feet-long female crocodile that was pregnant. Since it is their nesting season, it would have ventured out to lay eggs. On any other day, I would have rescued the crocodile myself but since she was pregnant, we had to handle the situation with care." The officials informed that crocodiles venture out to safe places to the lay their eggs and they have to extra cautious with them. The pregnant crocodile had come in from a nearby lake. It was rescued and then released in the same lake. The Malataj village is known for healthy breeding of crocodiles.